Hello Newbies and seasoned members alike, I am Octobersun and I will be your guest editor for this issue. What does one have to do to get noticed here? 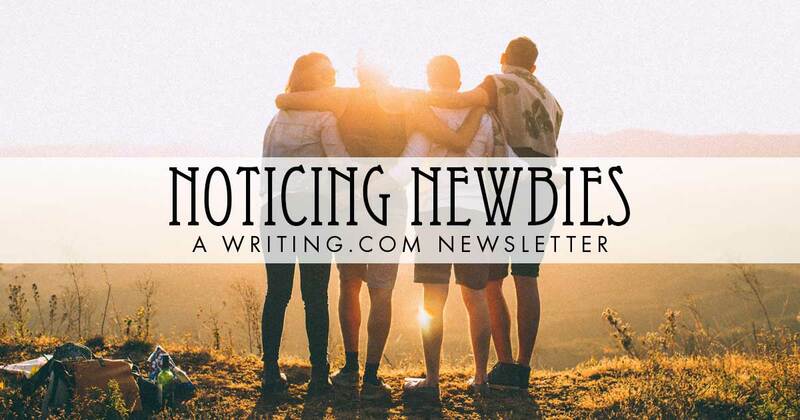 New members to the site are lovingly referred to as "Newbies" for their first six months of being members on Writing.Com. But what does it mean? How does it affect a new member to be a Newbie? And why does it have to stop? You're new here and most everybody is going to welcome you and be willing to answer most of your questions about the site. How does it affect a new member to be a Newbie? Why does it have to stop? Well, because you're all grown up now. Really though ... because there are new Newbies and they need and deserve the same upfront help you go as a Newbie. Once a year, I like to highlight some members that joined the site and hit the ground running with writing, reviewing, and taking part in site activities - whether run by the site owners or other members. Go check out their portfolios or have a read in my Editor's Picks below. PWheeler ~ love, joy and peace joined the site as a new member on January 16, 2018. She jumped in feet first in many activities, writing and other. At this time, she has sent out 730 reviews to other members! Wow! To top all of that activity off, she is even a NaNoWriMo Winner with 67,931 words. Linz joined on May 29, 2018, is already a NaNoWriMo Winner with 50,822 words in their first year here and has a small, neat assortment of items in their portfolio. Roland King 🌙 joined on September 14, 2018. He has already sent out 131 reviews and features prominently on the "Most Credited Reviewers" page. Mastiff joined on February 3, 2018. They are a NaNoWriMo Winner with 52,694 words. Not afraid to risk it all, Mastiff signed up for the gruelling one-year writing and reviewing activity "I Write in 2019"
Derrol Edwards- Fantasy Writer joined on March 15, 2018, sent out 165 reviews and also ranks high on the "Most Credited Reviewers" page. DuhhFactor joined on September 5, 2018. They have mastered the art of sending fun, friendly, and helpful reviews. Their 50 reviews have landed them on the "Most Credited Reviewers" page also. A selection of things to review, or just relax and enjoy reading. Either way, come on in! Delving into the world of breeder dog auctions. The hard life of a 2020's entrepreneur. In the spirit of autumn colors brings natural light into the neighborhood. I received the following replies to my last Noticing Newbies newsletter "Case Colors"
Warped Sanity wrote: I love that you addressed case colors in this newsletter. Yes, we are all just people trying to hone in on our craft. I would also like to add that a yellow, blue, or purple case does not necessarily mean we are considered better writers. There are many black cases who have more writing experience, hence they are much better writers than I am. So true too! Just by looking at the Most Credited Reviewers page or who won at NaNoWriMo this year, it's all case colors. Who we are as a writer has nothing to do with the case color. Catch-up Fyn wrote: Thank you for including my short story! Every single one here started out with a grey case. And we really are one color: humanity. Generated in 0.70 seconds at 6:06am on Apr 24, 2019 via server WWW1.